This V-back hook seemed very recent in manufacture hinting the design is still being made somewhere on the planet. Some versions glimpsed seemed old and having seen many years of use. Not so these. Note however that the horizontal hook dimensions are not well modulated relative to the grid spacing. 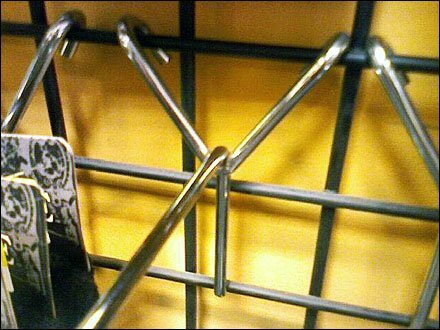 The long vertical leg is sized for 3-4 inch grid, even though these hooks appear on other display surfaces.